One of the largest metal producers in Europe, this low-grade, low-cost operation mines nickel, zinc, cobalt and copper. With a strong focus on continuous improvement, the mine is also establishing itself as a best-practice leader in sustainable mining. 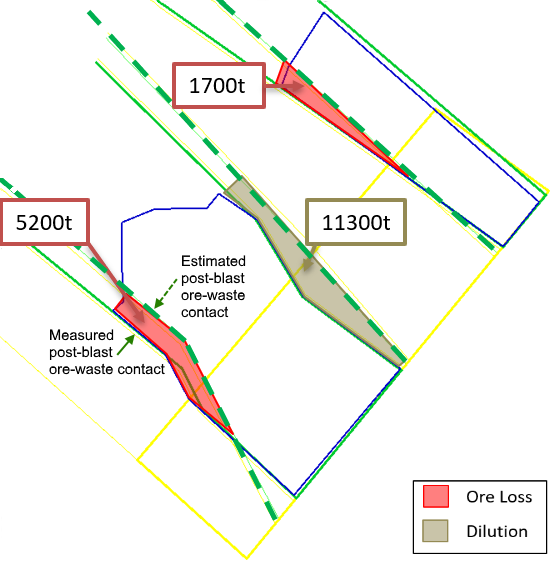 Mine operations were able to accurately adjust loading maps to account for blast movement and minimise ore loss. 2. Calculated by BMM Explorer. This blast map shows pre- and post-blast ore polygons, and areas of ore loss (pink) and dilution (brown). In this blast, accounting for blast movement added €211,285 of value.